Do You Know Which Porsche Is Tearing Up The 'Ring In This Video? Can this really be the 2016 GTS? 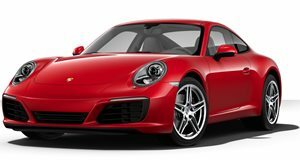 With its new turbocharged engines, the newly-revealed Porsche 911 has been met with quite a lot of controversy. But according to the spotter who posted this video, the 911 seen gobbling up the corners at the Nurburgring in this video is actually the 2016 Carrera GTS, one of the few models that will retain a naturally aspirated engine when it is revealed later this year. Meanwhile, it sounds to us like the turbocharger sound is quite eminent here, meaning that this could be the next-generation Carrera S sporting a centrally-mounted sports exhaust system. Whatever it is, it pulls off some sweet performance that proves that a turbocharger may not be the end of the world. Can you help determine which 911 we're looking at here?